​Rocky Mount's Downtown Coffeehouse, featuring Red Rooster Coffee. Welcome to the Whole Bean Coffeehouse. 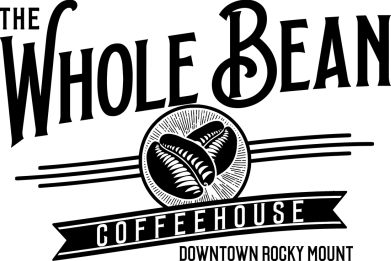 ​​We want to give you an authentic coffeehouse experience, starting of course, with superbly good coffee. Come in and sit a while in our comfortable club chairs, or relax at a table, and either way enjoy the free WIFI. We also offer high speed USB charging outlets, for your convenience, to charge your phones, tablets and even laptop computers. We serve a small panini and wrap menu, as well as baked goods, and Kiwi-Cakes cupcakes. Brewed coffee and genuine espresso drinks feature Floyd's own, Red Rooster Coffee. Local tea, smoothies, and hot chocolate available as well. We have an underlying mission to support adoption by helping local families through fundraisers and other means. As of June 12, 2017 all of our salads, and wraps with lettuce, will feature deliciously amazing fresh lettuce from local grower, Four Oaks Farms LLC! As of June 15, 2017 all of our milk based espresso drinks will feature milk or half & half from Homestead Creamery, Inc! Date Night Special! For $20 plus tax, you can choose any two sandwich or wrap meals, any two of our available desserts, and any two of our regular iced tea, brewed coffee, or bottled soda. Upgrade to a 12oz latte for just $2 per latte. We had our grand opening on December 2, 2016. 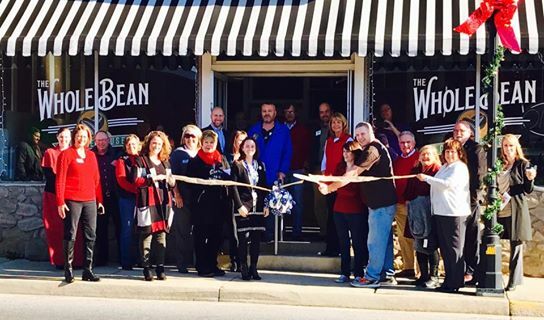 Ribbon Cutting was at 10:45 am with our celebration happening during the Come Home to a Franklin County Christmas event! Thank you to all who participated in this momentous event. Stay tuned as we continue to update our website. Visit us in Historic downtown Rocky mount!